MailChimp is a popular email marketing service that offers generous plans for small and developing enterprises, and can also handle large volumes of emails for big businesses and organizations. Known for their low-cost plans ideal for startups, MailChimp also offers business-enhancing analytical features and strong technology tools that allow users to effectively use email to get in touch with their clients and prospective customers, market their products and services with ease and accuracy, and turn leads into actual sales. Easy to use and extremely affordable, MailChimp is a powerhouse in the email marketing solutions market. With MailChimp, you can easily create, execute, and analyze ad and email campaigns. The platform enables you to manage subscribers, generate custom reports, view click-through and success rates, track your emails, and ensure full transparency of campaigns. You can select from a range of pre-designed templates or create your own custom templates. Startups and companies that have a small budget can utilize the freemium plan that allows you to send up to 12,000 emails per month to up to 2,000 subscribers. The free package includes most of the key features including the ability to create ad campaigns and access to marketing automation workflows. You can use the mobile app to send and track campaigns from anywhere. Utilize the range of informative tutorials to maximize the system’s effectiveness and generate detailed reports to keep improving your campaigns. MailChimp owes its popularity to its cheery construction and humor on top of its very simple and affordable pricing options. Here are some benefits the platform brings to the fray: It offers many sources and materials to help users plan and succeed in their email marketing campaigns. Publish your own newsletter or choose from MailChimp’s templates and start marketing with your own branded newsletter. You can divide and categorize your mailing list to engage different audiences. 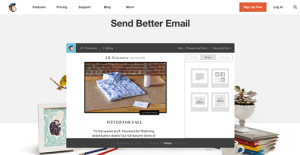 The RSS-to-email option automatically sends out your newsletter when you update your blog. Get updated on the progress of your campaigns with analytics and detailed reports. Mobile apps allow you to work with both Android and iPhone operating systems. Eliminate manual tasks by automating them using pre-designed marketing automations. This enables you to concentrate on strategy, and engage and follow up with people who matter. Add your brand insignia to your signup forms by customizing them. You can integrate the forms on your website and social media pages. Plus, you can import an existing list and also gather signups from mobile devices. Utilize integrations to keep your data updated between systems. Segment your subscribers and send them targeted emails based on criteria such as their open/click history or geolocation. You can also send blast emails to the full list of subscribers. Create automated campaigns by using automated workflows and RSS-to-email that enable you to send messages based on set triggers. Reporting tools enable you to learn who’s opening, clicking, and returning for more. The reports can be viewed on mobile devices and you can easily export them to share with team members and clients. Use Tweet Trend to learn subscribers’ actions on Twitter. The Google Analytics integration provides insightful stats on how your email campaigns impact your website traffic and online sales. Each organization has different wants and requires an application that can be personalized for their size, kind of employees and clients, and the particular industry they are in. For these reasons, no software can offer perfect functionality out-of-the-box. When you look for a software product, first be sure what you want it for. Read some MailChimp reviews and ask yourself do you want basic tools or do you need complex functionality? Are there any industry-specific tools that you are seeking? Obtain the answers to these questions to assist your search. There are lots of aspects that you need to mull over and these include your budget, particular business wants, your organization size, integration needs etc. Take your time, check out a few free trials, and finally zero in on the system that offers all that you want to enhance your firm effectiveness and productivity. We realize that when you make a decision to buy Marketing Software it’s important not only to see how experts evaluate it in their reviews, but also to find out if the real people and companies that buy it are actually satisfied with the product. That’s why we’ve created our behavior-based Customer Satisfaction Algorithm™ that gathers customer reviews, comments and MailChimp reviews across a wide range of social media sites. The data is then presented in an easy to digest form showing how many people had positive and negative experience with MailChimp. With that information at hand you should be equipped to make an informed buying decision that you won’t regret. What are MailChimp pricing details? What integrations are available for MailChimp? Pros: MailChimp probably doesn't sound that powerful, but trust me, the name has nothing to do with the capacity! MailChimp is a beast in online marketing, wiping competition out with amazing templates, rigourous listing, incredibly easy interface, and top notch analytics. The workflow is robust but simple, segmentation is streamlined, and support is live and very responsive, and there is also a free plan to try it out, while paid rates depend on the size of your business and its growth rates. Cons: The thing is that MailChimp is completely different from all platforms of its kind, and migrating to it with excessive data and multiple subscribers can be a bit bumpy. You need to understand how it works, and the main hint to do it is to put the needs of your user in front of your own. Your lists will work out, and the effort will be worth it, trust me and you will be impressed. Pros: The design and interface of this software are straightforward to use and very intuitive. It is also straightforward to understand how to use and makes getting data out very easy. The campaign dashboard for this software is very friendly. When the user is replicating a campaign, you can be able to see all information on one page instead of clicking through separate pages. You will therefore not fear if something changed because it is evident in one place. Cons: The premium account is a bit costly and might not be the best choice if the user has to send high-volume of mails but with lesser cost. Easy to setup, easy to integrate, a great builder for your media templates, and easy distribution. If you need more information about MailChimp or you simply have a question let us know what you need and we’ll forward your request directly to the vendor.